A mother of two and resident of Ikotun, a suburb of Lagos, Mrs. Olufunmilayo Ajilore, has landed in deep waters over alleged lesbianism. The heavily pregnant mother of two children was recently caught in the act of lesbianism by her in-laws and as a result that she was physically battered and forcefully evicted from her matrimonial home after being treated at a nearby hospital, Shasha Medical Centre. 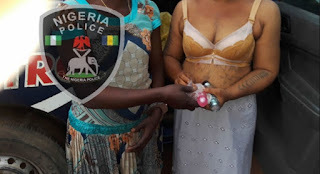 It was gathered that the woman’s ordeal did not however end there as a prominent member of her husband’s family is insisting on having her punished in a traditional way for daring to engage in lesbianism, a practice according to him, Yoruba traditions and culture frown at. She was also meant to be punished for disgracing the family and putting her husband’s name in disrepute. The mother of two, because of the issue, has also been ostracized by friends and family members. As at the time of filing this report, Mrs. Ajilore has been running from pillar to post as her life is now under threat by her in-laws that are bent on using the traditional means of cleansing her of the abominable conduct as well as the society itself which sees homosexual and lesbianism practices as offences punishable under the criminal code. She is therefore not protected by the society she currently seeks protection from and to compound her woes, she has also lost her job and presently feeding from hand to mouth. Mrs. Ajilore is presently traumatized as she does not know where to turn to for solace and succour. She needs the help of every Nigerian at least for the sake of their two children and the pregnancy she carries. Her family members promised to help out but not too long ago became helpless themselves as six members of the family died in herdsmen attack and properties worth millions of Naira destroyed.